Robotronicdiagram. - We think this is very old version of Protel electronic software that still used for electronic student and also electronic hobby to design electronic schematic and continue with design PCB layout manually and auto-route. This Protel software version is Protel 99 SE full version. 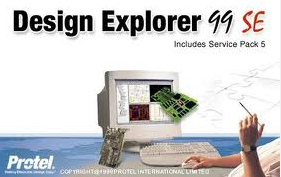 In this time we want to share with you about Protel 99 SE full version software to design schematic and PCB layout, and then we will give you link to take Free Download Electronic Software Protel 99 SE Full Version from other server easily. So please follow with Robotronicdiagram blog here. Protel 99 SE is software that used to design electronic schematic, run schematic simulation and also to design PCB layout with size of components dimension layout. We can run Protel 99 SE in operation system Windows 95, 98, NT, XP, and also Windows 7. Maybe you will ask why we must use Protel 99 SE? It is because in Protel 99 SE there are many easily when we use this software. One of the advantage when we use this software is there is facility that can used to make PCB layout autoroute. Although we design very difficulty circuit, we can convert into PCB layout easily with autoroute facility. So you can enjoy this software when you use it. And now we will give you link to take Free Download Electronic Software Protel 99 SE Full Version for Schematic and PCB Layout Design easily from external server. Please click link below to download this software easily and please provide 116MB to save this file. NEXT to DOWNLOAD CONTINUE . . .
Watch Video " Run Protel 99 SE on Window 7 & Solve library File Not Recognized Error"